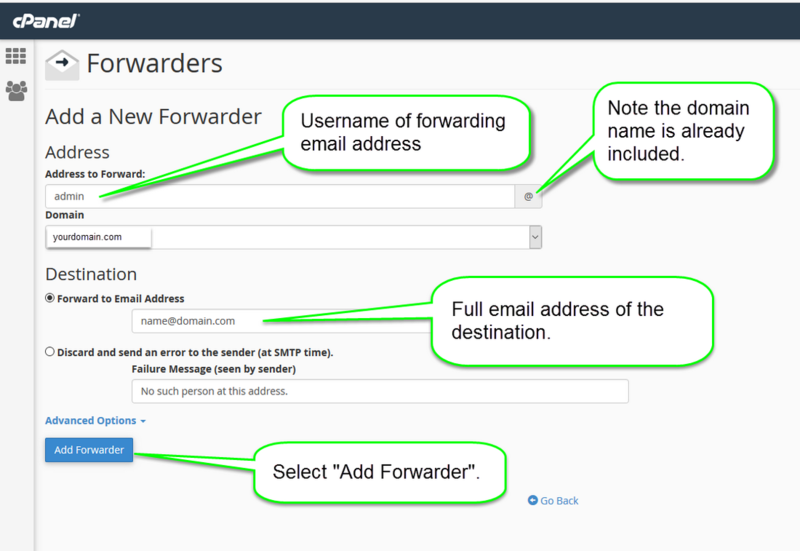 If you want to forward your domain’s emails to another email account, you can do this easily with an email forwarder. For example, if you have email addresses like admin@yourdomain.com, sales@yourdomain.com, info@yourdomain.com, you can forward these to one email account, to save you from checking every account. To set up email forwarders, you need to login to your cPanel account that would have been provided by us during your web hosting provisioning. If you need your cPanel login to be resent please open a support ticket. To login to you cPanel go to your www.yourdomain.com/cpanel and you will be presented with a login window. Enter the info provided by us. Once logged into cPanel, got to the "Email" section and select "Forwarders". Type in the forwarding email address (without the domain name), the full email address of the destination and select “Add Forwarder”.